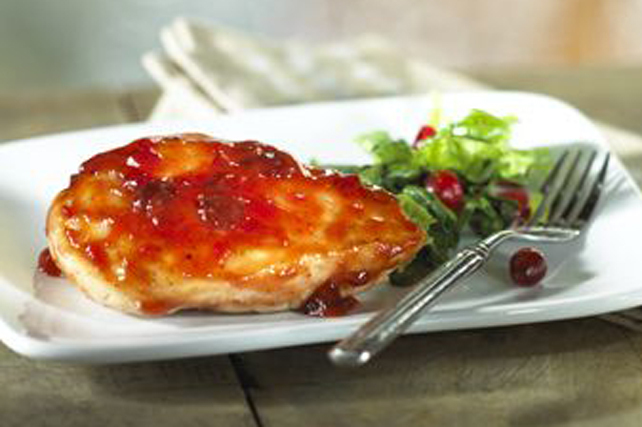 The sweet-and-tangy cranberry glaze adds the perfect finishing touch to these delicious chicken breasts. And since this easy-to-make recipe requires just a handful of ingredients, it's the perfect dish to serve as part of a quick weeknight dinner. Mix all ingredients except chicken and oil until blended. Pound chicken to 1/2-inch thickness. Heat oil in large skillet on medium heat. Add chicken; cook 2 min. on each side or until evenly browned on both sides. Pour ketchup mixture over chicken; cover. Simmer on medium-low heat 8 to 10 min. or until chicken is done (165ºF), turning after 5 min. Place chicken in freezer-weight resealable plastic bag; pound with side of heavy can, rolling pin or meat mallet until chicken is desired thickness. Serve with torn salad greens tossed with fresh cranberries.